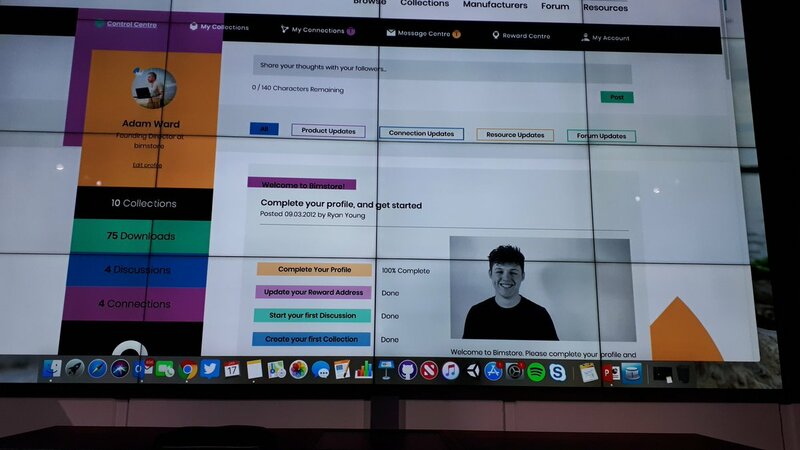 UK-based BIM object library bimstore launched its new version 4.0 at an event at the Rocketspace venue in Islington, London yesterday (17 January 2019 – news release). Originally launched in 2011 by Newcastle-based architectural practice Space Group, bimstore claims to be the UK’s largest manufacturer-specific BIM library, and sits alongside the group’s consultancy business, BIM Technologies. The platform was rebuilt in 2013 when the platform was being used by 70 manufacturers to host over 2000 objects, and had some 10,000 registered specifiers using the site (access is free to specifiers), who had completed 400,000 downloads since launch. Like other providers in the product library field, Bimstore’s business model is based on manufacturers paying an annual hosting charge; manufacturers can also commission the business to create their BIM object content. This has become a competitive marketplace with Newcastle neighbours NBS’s National BIM Library and SpecifiedBy (posts) also up against Sweden’s BIMObject, Cobuilder’s GoBIM from Norway, the US’s SmartBIM, BIM&Co from France and MagiCAD Cloud from Finland, among others, as well as manufacturers’ own object-hosting websites. In October 2017, BRE announced its DataBook project, set to launch in 2018, linking BIM objects to fixed manufacturers’ data sources. In October 2018, the UK BIM Alliance industry organisation published a State of the Nation report, A fresh way forward for product data (PDF). Written by a group chaired by Su Butcher, this highlighted issues including the lack of a commonly agreed standard for digital product data in the UK or in Europe, the need for ‘a golden thread’ to manage product data through the project lifecycle, and problems with how product data is currently hosted and managed. On this last point, it particularly noted how the different hosting companies each had slightly different ‘standards’ for object creation, which were not all aligned with each other. The report recommended that manufacturers’ product information management (PIM) databases should be linked (ie by API) to any company hosting their information, enabling manufacturers to manage one database with all other information automatically linked – ie a “single source of the truth”. Bimstore founders Rob Charlton, left, and Adam Ward presented the new version to invited guests at Rocketspace, noting the retirement of ‘Ermintrude’, the brand’s yellow cow mascot, and its replacement by a new dynamic logo (the one above is just one of over five million variants). Charlton said the new bimstore, developed over 14 months, aimed to break down silos between specifiers and manufacturers, encourage collaboration, and champion better ways of working. It also aimed to meet the recommendations of the post-Grenfell Hackitt Review for a more rigorous digital ‘golden thread of building information’. Aspects of the new site’s operation resemble familiar social media platforms such as LinkedIn, with abilities to create personal profiles and to connect to and message individual users, and so build communities, both generic and specialist. In a live demo, Ward showed “curated collections“: bundles of content (either private or public) created within bimstore to support particular communities or specialisms – temporary works, retro furniture, etc. The platform also offered a few gimmicks to encourage communication and engagement – t-shirts, special status (“pineapple”, “veteran”) for users of the site’s discussion forum, etc. Manufacturers can log into the platform and view real-time activity feeds and metrics (the number of times their objects have been viewed or downloaded, their top products, top search terms, etc). Ward demonstrated the bimstore Data Manager showing how easy it was to edit metadata and to create new variants of objects in the system. Importantly, the platform can be connected via an API to a manufacturer’s own website, PIM application or platform – fulfilling that UKBIMA recommendation for a ‘single source of truth’. API interfaces also enable data downloads from bimstore into a manufacturer’s CRM system – potentially, a powerful aid to product sales and marketing teams. New-look bimstore also now has ‘apps’: modular 3rd party integrations with bimstore partner solutions. Particularly interesting from a project collaboration and whole life value perspective, Ward said bimstore’s development roadmap includes integrations with project ‘endpoints’ so that manufacturers might connect in real-time to specific instances where their products have been installed and are now operated as part of built assets.